Three years ago, on February 12, 2014, viewers tuning in to their morning news witnessed and heard an almost unbelievable story – a sinkhole had opened inside the National Corvette Museum in Bowling Green, Kentucky, and eight Corvettes fell victim… lying at the bottom of the more than 30 foot deep gaping hole. Fortunately, the cars and building were the only things damaged as it occurred in the early morning hours before anyone was in the Museum. The story captivated those who watched it, and while the Museum initially planned to put the past behind them, the interest in the sinkhole and damaged Corvettes was undeniable. Last year, the Museum commemorated the second anniversary of the international headline making occurrence with a ribbon cutting for a new exhibit… Corvette Cave In! The Skydome Sinkhole Experience. The exhibit was well-received, helping the Museum achieve the second highest attendance in its 23-year history. The positive reception can be seen on travel review sites like Trip Advisor, with reviewers describing it as “amazing,” “interesting,” “astounding,” and “astonishing.” The exhibit features eight sections, from a recap of what happened the day of the sinkhole, the media coverage and pop culture aspect, to the cars themselves, the recovery and repair process, and caves and karst landscapes, leading to a grand finale cave-in experience. After interacting with the engaging display, visitors are led into the Skydome where they can see an outline of where the sinkhole was, an outline of where the cave is and even peer down the more than 30-foot-deep shaft into the remaining portion of the cave. Perhaps the most awe-inspiring part of the exhibit is all eight Corvettes on display, placed in almost the same spots as they were prior to their fall. The 2009 ZR1 Blue Devil was restored by General Motors in the fall of 2014 and revealed at the SEMA Auto Show prior to being returned to the Museum. The 1994 “One Millionth” Corvette’s restoration was a much more painstaking process – garnering four months of work and 1,200 man-hours as the quest to save the signatures of those who built the car became top priority. Five of the Corvettes sustained damage beyond repair, including the 1984 PPG Pace Car, 1993 ZR-1 Spyder, 1993 40th Anniversary, 2001 Mallett Hammer Z06 and 2009 1.5 Millionth. The question remains… what about the 1962 Corvette? On Thursday, February 9 the car, still covered in dirt and debris from the sinkhole, was removed from display in the Skydome and transferred to a garage bay where it will undergo restoration work to bring it back, better than ever. The on-going work will be performed in the Museum, and guests will be able to see the car’s progress, oftentimes as it is happening. 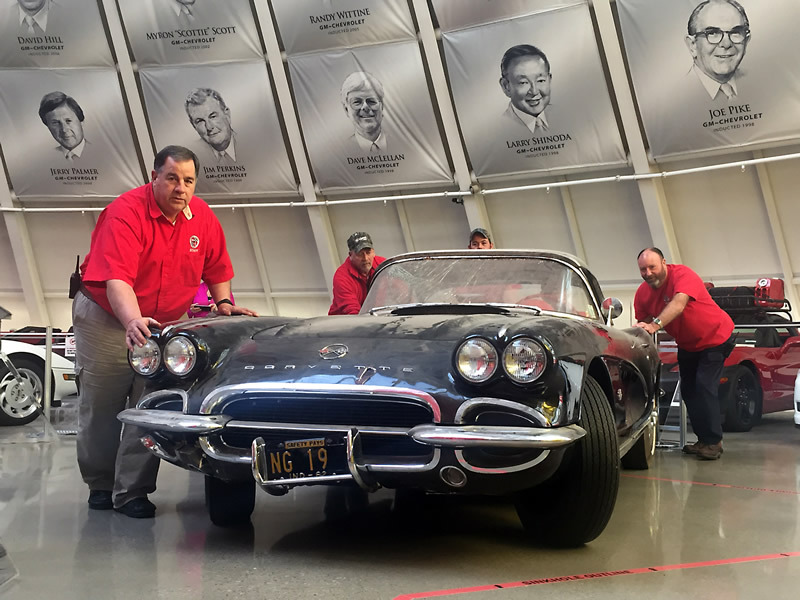 In addition to visiting the Museum to witness first-hand the work being performed on the Corvette, enthusiasts can tune in to Facebook and YouTube where a number of videos will be published by the Museum, providing updates and progress reports. Follow the Museum at facebook.com/corvettemuseum, youtube.com/corvettemuseum and corvettemuseum.org.